We’re all goofed up. We’ve got it all backwards. He’ s supposed to steal bases, and I’m supposed to hit the home runs. He’s our big deadline pickup. He hit a homer to win a World Series game against his old team. He’s a great pickup. It was weird for me because I don’t want to show up the other team. It happened. He didn’t hit me that hard. It was kind of a glancing blow, and the crowd was so loud that you couldn’t hear it. The only two people who knew were me and Steve, and I’m surely not going to say anything. Yeah, that was kinda unbelievable. I don’t know who else throws a cutter that hard. You score five runs in an inning off Roy, that just doesn’t happen a lot. We had some huge two-strike hits. People who know me and get to know me understand what I’m about. I didn’t hear him call me out. Do we feel lucky? No. One of the most bizarre plays I’ve ever been a part of. We’re aware of the ramifications of this series for everybody who’s involved. But that’s all anybody talks about all the time – Red Sox and Yankees. It doesn’t seem like there are any other teams out there. I didn’t hear him call me out. Josh didn’t tag me. I think he thought he caught it. It was a tough situation. I ran. Just one of those things, I got good pitches to hit and I hit ’em. In the playoffs you get to start over and forget what you did in the past. There’s been a lot of stuff. I always seem to be in the middle of it. … It always seems like I’m in the middle of something. Even when I don’t do anything I do something. I tried to stay out of everyone’s way and not do anything, but it’s just the way it seems to go for me. What can you do? That could easily have been a tie game right there. I felt it, but I couldn’t really hear it. The only people who knew it hit me were me and Steve. It was a lucky break, what can you say? You get to the playoffs, you don’t expect to get 8 1/3, nine and nine (innings), not in this situation. It’s unheard of. He’s a great pitcher. He’s a Hall of Fame pitcher. But he’s got to throw the ball over the plate and we have to try to hit it. If he makes a mistake, we have to hit it, not miss it. We have to find a way to get deep into the game and get deep into the pitch count and get him out. It’s not going to be an easy task. We don’t like to see people say stuff in the newspaper, but he didn’t say anything bad about me. So good luck to Carl. For him, he likes to have it when he’s on the mound. He’s the type of guy that feels more confident when he has his velocity. You can see him looking up there to see where it is. Typical Brad. Get him through the first inning and he’ll do OK for you. 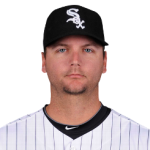 Anthony John Pierzynski was born on December 30, 1976, in Bridgehampton, New York. He attended Dr. Phillips High School in Orlando, Florida, where he won All State honors in baseball. Cleveland Indians outfielder/designated hitter Johnny Damon was one of Pierzynski's high school teammates. Pierzynski was involved in a controversial play that occurred on October 12, 2005 in Game 2 of the 2005 American League Championship Series versus the Los Angeles Angels of Anaheim. With the score tied and two out in the bottom of the ninth, with two strikes, Pierzynski swung at a low pitch from Angels pitcher Kelvim Escobar and missed, for strike three. Josh Paul, the Angels catcher, rolled the ball to the mound and left the infield. Pierzynski realized strike three had been called, but he had not been called out and ran to first base in case the umpire had ruled that the Angels catcher had not legally caught the strike three pitch. Home plate umpire Doug Eddings indeed ruled that the ball hit the ground and then went into the catcher's glove, meaning Pierzynski was safe at first. A pinch runner, Pablo Ozuna, replaced Pierzynski and stole second base. Third baseman Joe Crede hit a double three pitches later, scoring Ozuna for the winning run. A.J. was hired by Fox to be an analyst for the 2011 MLB postseason on the pre-game and postgame show. He again joined Fox for the 2012 Postseason.